Minister Environment & Forest, and MLA of Doimukh constituency, Nabam Rebia today appeal the people living on the bank of rivers and flood prone area to maintain precautionary measures for their safety of life and property. 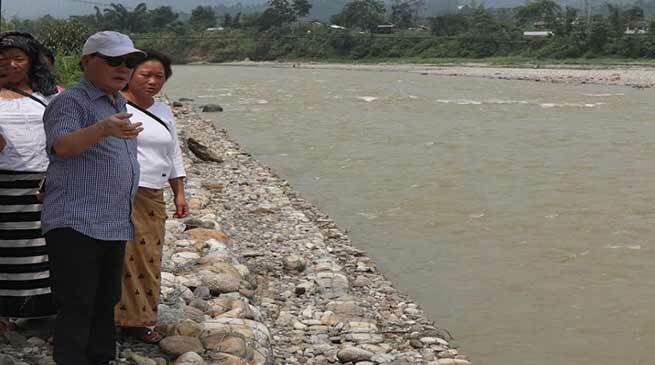 Rebia today visited and inspected the embankment constructed on bank of river Dikrong in Huto village alongwith local women leaders of the area. He said that it is high time and during monsoon and natural calamity one should remain away from river side and all such area which are detrimental to flood and landslide and dangerous for the existence of life. He said that last year embankment have been constructed which would protect the Doimukh township from the flash flood. The women committee of the Huto Village, Colony submitted a memorandum and requested the Minister for construction of good road in the colony and the area and Rebia later assured to construct CC road from Main road to Huto Colony and to Government Middle School measuring around 1.5-2 KM. He after viewing a heap of garbage in the colony request them to maintain cleanness and hygiene so that many disease could not attack normal people and surrounding remain clean and green. Earlier Minister alongwith Chairman Department of Indigenous Affairs Nabam Atum, Director DIA Tayi Taggu, Executive Members of Indigenous Faith and culture Society of Arunachal Pradesh (IFCSAP) inspected probable place for establishment of HQ of DIA at Jully and Yupia.